As you (by you, I mean fellow students of SMK Bandar Utama Damansara (3)) should know, our school had been bestowed the status of Cluster School of Excellence, with us being recognised as excellent in the fields of Science and Basketball. Since then the school has been inundated with corny and unsavoury rather interesting jokes about this recent event, reflecting the shock of the school when we got the status, since we did not even expect to get it (especially when it is our first time reluctantly applying for it, as our beloved Principal would say). Perhaps this is due, in part, to the lack of awareness of what constitutes a cluster school of excellence. Cluster school is a brand given to schools identified as being excellent in its cluster from the aspects of school management and student achievement. 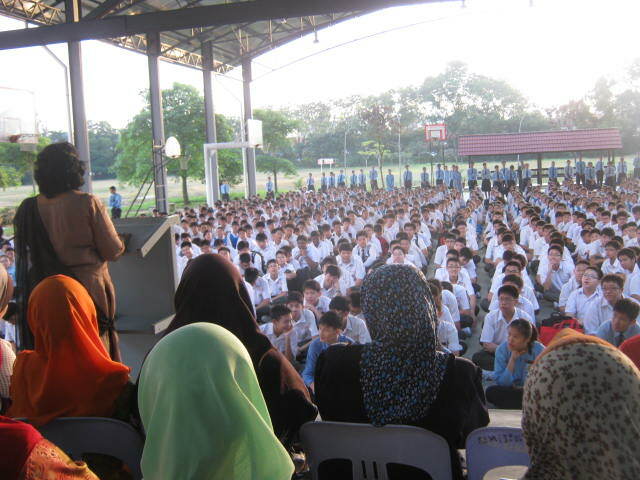 The creation of cluster schools aims at accelerating school excellence within the Malaysian education system and developing schools that can be emulated by other schools in the same cluster and outside the cluster. The establishment of cluster schools is contained in Chapter 9 of the Education Development Master Plan which was launched on 16 January 2006. Cluster schools are based on the second approach of the master plan, which is to develop the full potential of schools within the cluster of excellence whose mechanism is set out in the 6th strategic thrust, accelerating the excellence of educational institutions. Literature review indicates that the practice of grouping schools is practised in foreign countries to raise the quality of education. Such groupings are based on locality or excellence. For more information, you can read on here.